Student activists from Parkland, Fla., quickly mobilized after the shooting at Marjory Stoneman Douglas High School, becoming a vocal force calling for tighter gun laws. 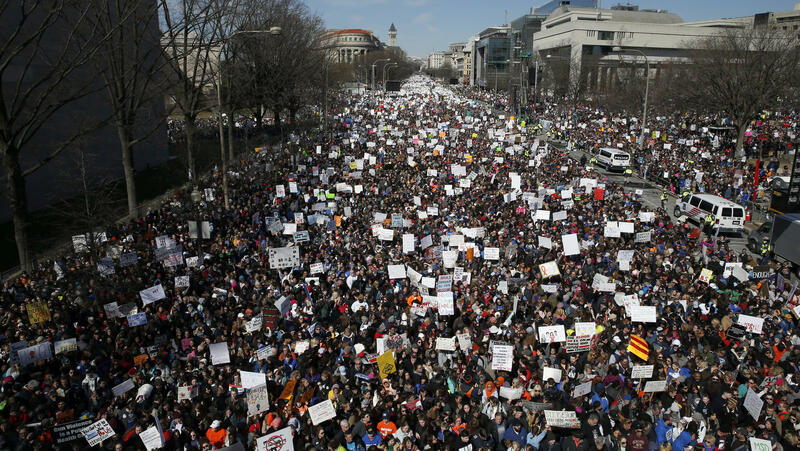 That movement led to mass "March for Our Lives" demonstrations around the country in March. Florida Gov. 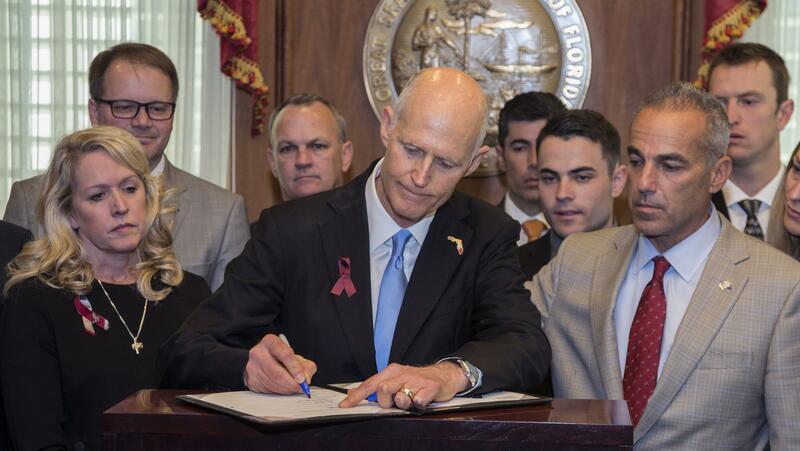 Rick Scott signed the Marjory Stoneman Douglas Public Safety Act in March, just weeks after the Parkland, Fla., shooting. In the midterm elections, Democratic congressional candidates were galvanized to campaign on a gun control message, with winning results. Feb. 14: Seventeen people killed — 14 students and three staff — at Marjory Stoneman Douglas High School in Parkland, Fla.
June 28: Five staffers killed at the Capital Gazette newspaper office in Annapolis, Md. Nov. 7: Twelve killed, plus the shooter, at the Borderline Bar and Grill in Thousand Oaks, Calif. Gun control groups point to February's Parkland school shooting, in particular, as a defining moment. Within weeks of the Parkland massacre, Florida's Republican governor, Rick Scott — who previously had an A+ rating from the NRA — broke with the group and signed a broad package of new gun restrictions. "I was very surprised," says Allison Anderman, managing attorney with the Giffords Law Center to Prevent Gun Violence. The scope of Florida's legislation was especially notable, coming as it did in a state that has earned the nickname "The Gunshine State" for its permissive gun laws. "To pass a package of bills that included an extreme risk protection order, raised the minimum age to purchase guns, prohibited bump stocks, extended waiting periods, and designated $2 million in funding for urban gun violence reduction programs, I think was tremendous," Anderman says. Soon after that, Phil Scott, the Republican governor of Vermont — another gun-friendly state — signed the most extensive gun control measures that state has seen. According to the Giffords Center, this year marks a "tectonic shift" for gun control legislation in the states. By its count, more than half the states passed dozens of gun control measures. That includes eight states, plus the District of Columbia, that passed extreme risk protection orders, known as "red flag" laws. Contrast that with 2013, after the elementary school shooting in Newtown, Conn., when states passed more laws loosening gun restrictions, rather than tightening them. In state legislatures this year, Anderman says, "the bipartisan effort was significant, and not something that we have really seen in previous years." She credits much of that momentum to the student activists from Parkland who quickly mobilized after the shooting and became a vocal force calling for tighter gun laws — a movement that led to "March for Our Lives" demonstrations around the country. "They have brought such a level of passion," Anderman says, "and a new voice, a voice from a younger generation that is saying, 'Look at what you have done to us, America. You have put us in harm's way. And we are not going to stay silent.'" In the midterm elections, Democratic congressional candidates were galvanized to campaign on a gun control message, with winning results. "Of all of the races that we worked on at the federal level, we won 90 percent of them," says Kris Brown, president of the Brady Campaign and Center to Prevent Gun Violence. 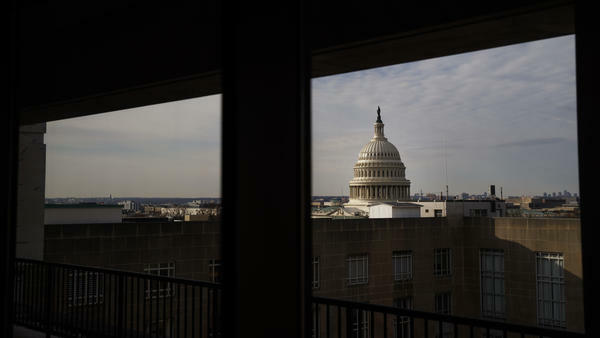 In their Washington, D.C., offices, we walk past a board with bumper stickers reading "ENOUGH GUN VIOLENCE" plastered over the names of defeated Republican congressmen. It's a long list. "In the House of Representatives," Brown says, "what we gained were about 40 seats where we defeated candidates who vote 100 percent of the time, every time, with the NRA." Now, with a Democratic majority poised to take control of the House, Brown says, "We have individuals elected who are committed to changing this issue, and many of whom feel that they've been elected with a mandate to make this a top priority. That is a sea change. And it's the beginning of something. It's not the end." In the final days of 2018, the Trump administration announced a ban on bump stocks — the devices that make semiautomatic rifles fire much faster, to simulate a machine gun's fire. That ban was expected, after the October 2017 shooting at a country music festival in Las Vegas. There, the gunman used bump stocks to mow down hundreds of concertgoers, killing 58 people. This past March, President Trump said, "Bump stocks are going to be gone." For gun rights groups, 2018 brought some gains at the state level, including laws in four states that expand "stand your ground" and self-defense laws, as well as successful efforts to fend off "red flag" laws in more than a dozen states. But, says Michael Hammond, legislative counsel for the group Gun Owners of America, "I would be lying if I said I thought it was a victorious year for us." In his view, 2018 is a mixed bag: "The anti-gun states clearly became more anti-gun and the pro-gun states became more pro-gun," he says. Hammond is frustrated that the Republican-controlled Congress failed to pass one of the gun lobby's key goals: concealed carry reciprocity, which would require states to recognize the concealed carry permits from all other states, including states with weaker gun laws. Now, with Democrats in control of the House of Representatives, Hammond believes the outlook for gun rights groups is worse. "It makes it impossible, I think, to pass pro-active legislation," he says. In fact, Nancy Pelosi, the House speaker-designate, has pledged to make passing universal background checks a priority early in the new Congress. More gun control measures are likely to follow in the House, and lobbyist Lawrence Keane will be among those working to defeat them. Keane is senior vice president and general counsel with the National Shooting Sports Foundation, which represents the gun industry. "I would expect to see an age-restriction bill," Keane says. "I expect we'll see an attempt to ban modern sporting rifles again. But what can get out of the House and what can pass the Senate are two different animals. "As Keane sees it, "that's a much steeper climb, given that the Senate became more pro-gun after the midterms," with Republicans increasing their majority by two seats. Looking forward, Keane and other gun rights activists are heartened by one long-lasting effect of 2018: a strengthened conservative majority on the U.S. Supreme Court. With this year's confirmation of Brett Kavanaugh, Keane concludes, "The Second Amendment is in a safer place." 2018 was another year of devastating mass shootings and another year of debates about gun control. Before we get to this story - as we've often said over the course of this year while reporting on mass shootings, there is some disturbing audio in this piece. Last week, the Trump administration moved to ban bump stocks. Those are devices that make semi-automatic weapons fire much quickly. It was a victory for gun control advocates, who also successfully pushed states to enact dozens of gun control measures. As NPR's Melissa Block reports, advocates link that legislative success to a specific turning point. MELISSA BLOCK, BYLINE: That turning point came early in 2018. UNIDENTIFIED STUDENT #1: Help, please. Please, they got a gun. BLOCK: February 14, Valentine's Day. UNIDENTIFIED EMERGENCY DISPATCHER: I'm getting a school shooting at Stoneman Douglas High School in Parkland. UNIDENTIFIED STUDENT #1: (Crying) Please hurry, please hurry, please hurry. BLOCK: A shooter killed 17 students and staff at Marjory Stoneman Douglas High School in Parkland, Fla. Within three months, there was another mass shooting at another high school, this one in Santa Fe, Texas. Ten people were killed. UNIDENTIFIED STUDENT #2: All we heard was, run, run. And next thing, you know, we hear, boom, boom, boom. BLOCK: And on it went - 11 worshippers killed at the Tree of Life synagogue in Pittsburgh; 12 killed, plus the shooter, at a bar in Thousand Oaks, Calif. The mother of one of those victims made this plea. SUSAN ORAFANOS: And I don't want prayers. I don't want thoughts. I want gun control, and I hope to God nobody else sends me any more prayers. BLOCK: So what about gun control in 2018? Well, in Florida, nicknamed the Gunshine State (ph), new laws came quickly. Just a few weeks after the Parkland shooting, Republican Governor Rick Scott, who previously had an A-plus rating from the NRA, broke with the group and signed a package of new gun restrictions. ALLISON ANDERMAN: I was very surprised. BLOCK: Allison Anderman is managing attorney with the Giffords Law Center to Prevent Gun Violence. ANDERMAN: To pass a package of bills that included an extreme risk protection order, raised the minimum age to purchase guns, prohibited bump stocks, extended waiting periods - I think, was tremendous. BLOCK: And soon after that, the Republican governor of Vermont, another gun-friendly state, signed the most extensive gun control measures that state has seen. The Giffords Center says 2018 marks a tectonic shift, with more than half the states passing dozens of new gun control laws. Contrast that with 2013 after the elementary school shooting in Newtown, Conn., when states passed more laws loosening gun restrictions rather than tightening them. Allison Anderman credits a lot of this year's momentum to the student activists from Parkland. ANDERMAN: They have brought such a level of passion and a new voice, a voice from a younger generation that is saying, look at what you have done to us, America. You have put us in harm's way, and we are not going to stay silent. BLOCK: Another dramatic shift in 2018 - in this election cycle, gun control groups outspent gun rights groups for the first time ever. And Democratic congressional candidates successfully campaigned on a gun control message. KRIS BROWN: Now it's a different world. BROWN: We have individuals elected who are committed to changing this issue and many of whom feel that they've been elected with a mandate to make this a top priority. That is a sea change, and it's the beginning of something. It's not the end. MICHAEL HAMMOND: I would be lying if I said I thought it was a victorious year for us. BLOCK: That's Michael Hammond, legislative counsel for the group Gun Owners of America, which bills itself as the only no-compromise gun lobby in Washington. HAMMOND: We're the group that keeps the NRA honest. BLOCK: Hammond points to some victories at the state level, including four states that expanded "stand your ground" and self-defense laws. But he's disappointed that the Republican-controlled Congress failed to pass one of the gun lobby's key goals - requiring states to recognize concealed carry permits from all other states. Now, he says, with Democrats in control of the House, the outlook is worse. HAMMOND: It makes it impossible, I think, to pass proactive legislation. BLOCK: In fact, Nancy Pelosi, the House speaker-designate, has vowed to make passing universal background checks an early priority. More gun control measures are likely to follow, and lobbyist Lawrence Keane will be among those working to defeat them. He's with the National Shooting Sports Foundation, which represents the gun industry. LAWRENCE KEANE: I would expect to see an age restriction bill. I expect we'll see an attempt to ban modern sporting rifles again. But what can get out of the House and what can pass the Senate are two different animals. BLOCK: Keane and other gun rights activists are heartened by one long-lasting effect of 2018, a strengthened conservative majority on the Supreme Court. With this year's confirmation of Brett Kavanaugh, Keane concludes, the Second Amendment is in a safer place. Melissa Block, NPR News, Washington. (SOUNDBITE OF TEEBS' "SHOOUSS LULLABY") Transcript provided by NPR, Copyright NPR.